"Sparifankal" was a very unique rock group from Bavaria. 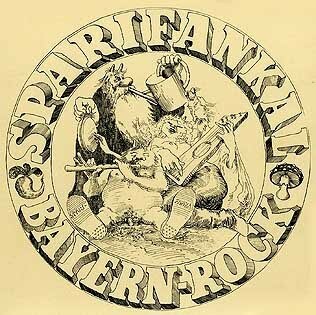 In 1972 the Bavarian anarchist rock band "Sparifankal" developed and practised the so-called "ruebel-music", together with musical laymen, children and "patients", as a kind of harmonic/disharmonic therapy. "Sparifankal" utilized genuine Bavarian lyrics which differ drastically from higher German. With this approach, the band developed a new concept: political rock music sung in Bavarian language. During 1976 the band recorded their first vinyl "Bayern Rock" (Bavarian Rock). It was released under Trikont/Schneeball/April, the first German independent label founded by several German underground bands such as Embryo, Missus Beastly, Ton Steine Scherben and Checkpoint Charlie to be independent from the record industry. "Sparifankal" toured mainly in southern Germany, but also found time to perform at several large festivals all over the country. The band released two more albums, the acoustic "Huraxdax Drudnhax", which set new standards in traditional German music, and the 2LP-album "Negamusi", which helped to bring the band international exposure. But during 1981 SPARIFANKAL played their final concert... In 1999 the members of SPARIFANKAL came together again to do a punk-benefit-concert for a former member of the group. The band found that this reunion concert was too much fun not to reunite. After very successful concerts at some larger festivals in southern Germany the band found it necessary to record an album with the new songs. During the hot summer of 2003 "Dahoam Is Wo Andas" (Home is Somewhere Else) was recorded on an analog machine without any "frickelfrackel" by William Faendrich in Huglfing. It is still real "Bayern Rock", and totally different and opposed to all that polished global-touristic Alpinyodelrock. Carl-Ludwig Reichert, Bavarian lyricist extra-ordinaire, who rocked the cradle of Bavarian poetry (under the alias "Benno Hoellteufel") and was a memeber of Sparifankal, remembers: "Das war im Kafe Kult und da haben wir dann halt gespielt, es waren schon ein paar Leute da und die haben sich köstlich amüsiert und gleich den Pogo getanzt und ich hab gedacht, die verarschen uns jetzt, die haben da die größte Gaudi. Und dann spiel ich das zweite Stück, der 'braune baaz', und das war schon irgendwie ein Erlebnis, wenn da so zehn Irokesen vor dir stehen und das mitsingen. Die kannten das auswendig, ich hab‘ gedacht, ich werd nicht mehr! Witzigerweise hat uns ja schon Anfang der 70er Jahre der Roman Bunka von Embryo als Punks bezeichnet. Das ist im Englischen einfach ein Schimpfwort, so eben wie Sparifankal "ungezogenes Kind" oder "Teufel" auf Bayerisch heißt. Punk heißt "ungezogener Typ", "Penner", und so weiter." "Sparifankal 2", a spontaneous freak group starting in september 2009 - louder and heavier than ever! For more info on them see "The crack in the cosmic egg". Nothing can be 'very unique'. Only 'unique'. Now there´s a fresh link. Hope you enjoy it!